Though I was unsuccessful at getting hold of Eisenhorn on the day he was released, I did manage to get hold of one on eBay for less than GW's price which was nice! 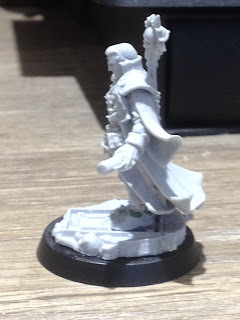 It really is a lovely miniature, and while I was thinking of finding a bald head for him (I had already found a walking cane) in order to convert this into an older rendition of the character, I liked the base sculpt so much I elected not to. The miniature went together fairly well though there was quite a lot of flash to cut and scrape away. I think I managed to get all the mould lines but I wouldn't be surprised to find some during painting. There were two small bubbles on the resin (one on his collar and one on his book) but these were easily filled. The only thing I really dislike about the miniature is how far forward he is leaning. I decided to try straightening him up a bit which proved quite easy to do by simply repositioning his left foot. I didn't even need to cut his foot off, I just cut away some of the resin around his ankle, wiggled his foot a bit and added green stuff to fill the gaps I had made. For Cherubael I have taken some flagellant and ghoul bits (along with a few pieces whose origins I'm actually uncertain of!) 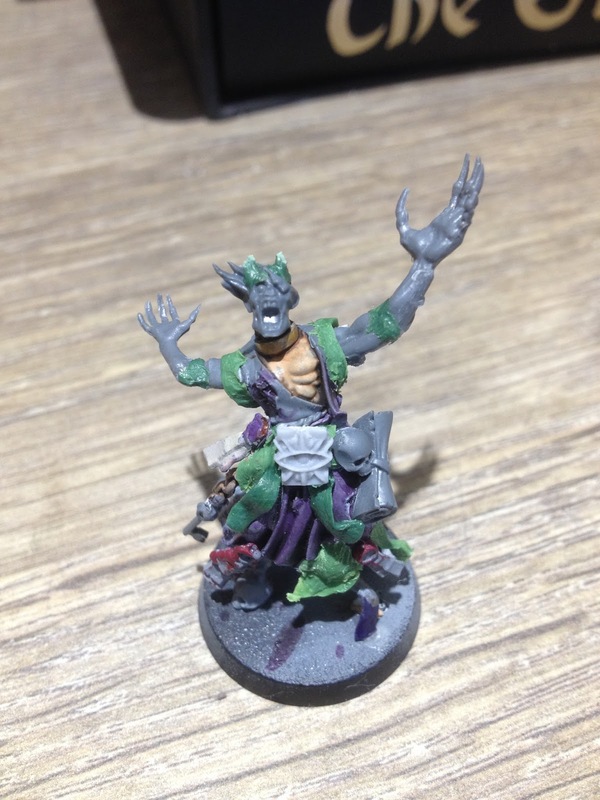 to create this unholy abomination as I don't like the old daemonhost models. I've still got some mould lines to clean up and some green-stuffing to do, but I'm rather happy with how this is shaping up so far. 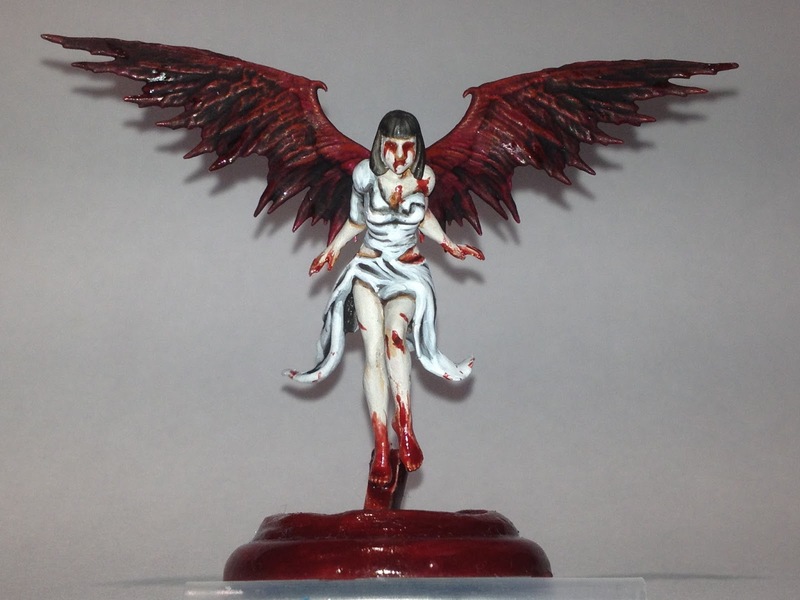 I did look up the 54mm miniature of Cherubael that was done for the old Inquisitor game for reference, but quickly realised that I would be unable to create an approximation to that with the pieces I had available. Instead I decided to just make what I thought looked like a cool daemonhost and await an official 28mm Cherubael should one ever be made. 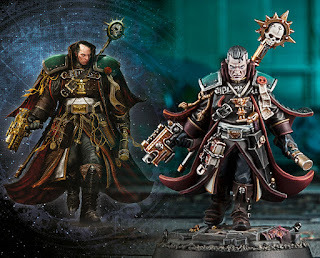 Alongside the Malus Darkblade series, the Eisenhorn trilogy was one of my first proper forays into Warhammer fiction so his exploits have a special place in my hobby-heart. 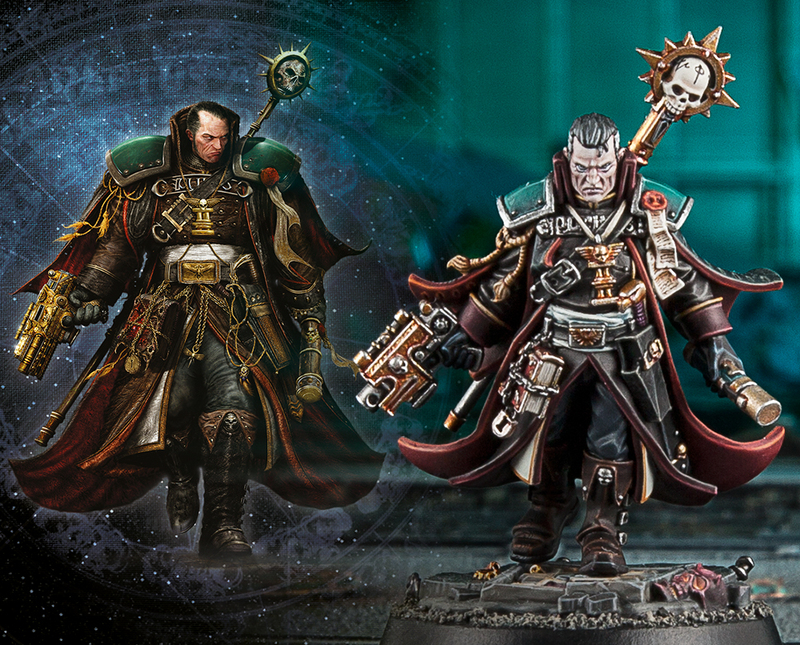 I'm therefore really looking forward to getting some paint on Eisenhorn and fielding him alongside some of my other Imperial armies. I also can't wait to getting round to picking up the new book 'The Magos' at some point, though I hope that Dan Abnett hurries up and writes the rest of the Bequin Trilogy soon!! I've had a lot of random thoughts about the hobby recently, and as I finish my first miniature of the year (its taken a while I know! ), I thought I'd take some time to ramble and lay out some of the ideas and opinions I've had floating around in my head. I was lucky enough to manage to pick up the alternate sculpt for Titania last Black Friday and I've had a lot of fun painting up the undead faerie queen. I tried as best I could to achieve a middle ground between her standard colour scheme and her appearance on the classic Red Joker artwork, and I think I've succeeded. Though I don't know if I'll ever build a crew for her, I can see her easily being the first of several Malifaux miniatures that I pick up solely for the pleasure of painting. I have only recently been made aware of Privateer Press's 'MiniCrate', which is a miniatures version of the loot crate business model. For those of you who aren't aware of it and fancy a look heres a link: MiniCrate. I've got a lot of thoughts on this because on a basic level it really appeals to me as a collector and a painter, which I think is really the target audience for this. After all, the miniatures that are part of this product are simply alternate sculpts and seemingly chosen at random from across the various factions, so not much use to gamers. I quite like the idea of getting a new miniature every month to just paint up and have on display, especially as most of these alternative sculpts are quite cool-looking. The 'mystery' aspect is what I think is the greatest turn-off for most people, as there's a good chance of not getting a miniature for any of your factions or even one you actually like. Miniatures can be quite expensive and it would be disappointing to end up buying something you don't even like the look of. Indeed, the whole thing seems quite expensive for just a single miniature every month, especially for anyone like me who does not live in the United States. While a novel and interesting idea, the whole thing doesn't quite work for me. Privateer Press aren't particularly my favourite miniatures manufacturer as far as aesthetic goes and I'm not deeply into the lore of the game, but I did think this product worthy of a mention as I can see it, or something similar to it, being successful in the future and possibly attracting me. I'm thinking of doing something with my Lord of the Rings miniatures this year. They are painted in quite a basic fashion and would benefit simply from a few highlights, a bit of dry brushing, and maybe some better basing. I also ended up with a part-complete second-hand Mumakil about two years ago I really ought to do something with. 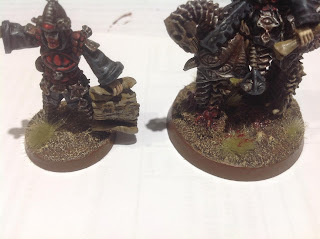 Of course I have other, more pressing painting matters to attend to first, but I can easily see my Easterlings or Uruk-Hai getting a little attention in future. Last year I was able to get hold of some second-hand Sisters of Silence which I've not really done anything with yet, but I have added a converted Astropath, an imprisoned psyker (to use as an objective marker), and some Tempestus Scions to represent the Black Sentinels of the Adeptus Astra Telepathica. I think I am going to use these as an allied detachment for my Custodes and paint them in the same way. Hopefully in future we will see some manner of combined 40k Talons of the Emperor codex and I can have my Custodes and Silent Sisters fight side by side properly. Though I still have lots of Death stuff to paint, I have been greedily eyeing the new Daughters of Khaine miniatures. 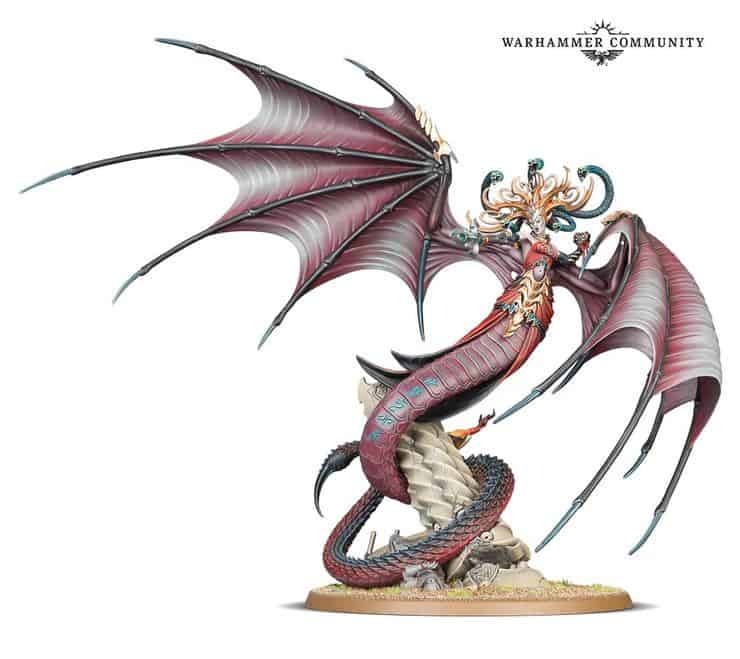 I am very tempted to pull my Dark Elves out of storage and start putting some of my Witch Elves on round bases in preparation for getting Morathi and some of her new mutant aelves. The main thing stopping me is the financial burden of my upcoming Custodes project (as well as all my other unfinished projects! ), though later on in the year I can see myself splurging on some Daughters of Khaine. First however I have a tonne of ghouls and skeletons to paint, and won't consider getting anything else for Age of Sigmar until they are done. Coming up on the blog soon should be my Malifaux miniatures which I am close to finishing; after which should hopefully be a little bit of Eisenhorn, some progress on my Lich war band, and possibly a bit of Age of Sigmar if I can get the colours on this next war band right. Life has continued to be hectic recently but I am managing to get some bits of hobbling in when I can.